Everyone knows how much fun making things with friends can be, so let us arrange your creative party in one of our purpose-built studios here at New Brewery Arts. It’s a unique way to celebrate a special event. Parties are first and third Sunday of the month. To book please follow the details at the bottom of the page. Parties are held every first Sunday and third Sunday of the month and taught by tutor Hannah Ellis. We do not offer children's parties outside of these days. Party activities suitable for boys & girls aged 5-12 years. Please chose one activity from the list below. 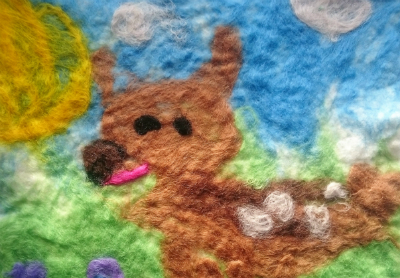 Learn how to create wonderful felt artwork using this exciting technique. A fun filled party for all! Use newspaper, tape and card to create the structure of your sculpture and embellish with feathers, jewels, pipe cleaners, glitter and more. Toucans, parrots, peacocks, birds of paradise…the choice is yours! Create creepy crawly sculptures from bumblebees to ladybirds using wire for their wings and legs, newspaper and coloured tape for the bodies and embellish with glitter, jewels, pompoms and more! Create magical 3D fairy houses using mod roc, paint and glitter. A messy party but lots of fun! Model the plaster bandage onto your face with help form a friend and paint and decorate with a design of your choice. Please wear messy clothes and hair tied back. Working on the floor, draw around each other and use paint, fabric, wool, glitter to create a life size portrait of yourself or an imaginary character. Mermaid, pirate, astronaut, artist… who would you like to be? Food can be provided as an add on to your session. Your party food is served in the cafe after your craft activity. We have a special party menu which costs £8 per child. You can also bring in a birthday cake or ask us to make you one. Adults are welcome to purchase items from the café menu or extensive cake counter display. We require full payment at the time of booking, no refunds are given but additional places can be added.